Professor Liz Kay MBE has been named the sixth most influential person in the dental profession by magazine, 'Dentistry'. An academic who specialises in primary care oral health promotion has been named the sixth most influential person in the dental profession by the magazine, Dentistry. The sixth place ranking for Professor Liz Kay MBE sees her climb one place from last year, and sit 43 places ahead of Health Secretary, Jeremy Hunt. 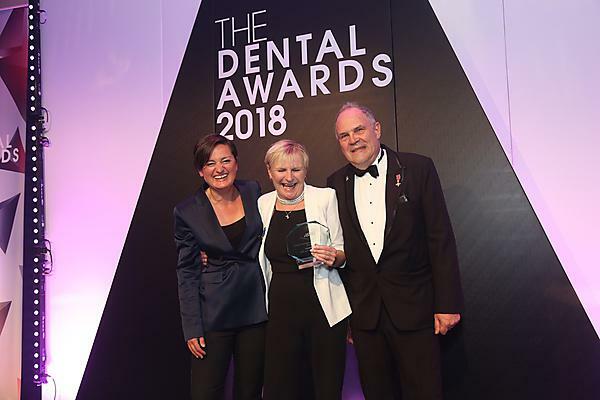 The recognition for her work comes just days after she was awarded the Outstanding Achievement award at the Dental Awards hosted by dental magazine, The Probe. Attending a sparkling ceremony in the Hilton Birmingham Metropole, Professor Kay collected the award from event host and Mock the Week regular, Zoe Lyons. Professor Kay was also recently named President of the Oral Health Foundation, and its Chief Executive Dr Nigel Carter OBE co-presented her award. “Liz is incredibly deserving of both this award and also being recognised as a key figure in dentistry in Britain. She has worked tirelessly, and continues to do so, to make sure that the best possible oral healthcare is provided to people across the country and has been hugely influential in shaping the face of dentistry as we see it today. Professor Kay led the development and implementation of the Peninsula Dental School (the first new dental school in the UK for 40 years). Her focus on primary care within dental education is internationally renowned. As an academic, she has written more than 150 papers and six books, with £1.5 million of research funding. Through her research and multiple external roles, she influences policy in dental public health at regional and national level. Her advocacy for women within higher education brings on the next generation of clinical educators and leaders. She pursues this work nationally, regionally and within the University of Plymouth where she sits on the University Athena Swan Committee and leads the Faculty of Medicine and Dentistry Athena Swan Self-Assessment Team, which achieved the prestigious Silver Award last year. She supports the NHS and dental public health as a (Shadow) Governor for Royal Cornwall Hospitals Trust, as Associate Non-Executive Director of Plymouth Hospitals NHS Trust and as Topic Expert to the NICE Public Health Advisory Committee. She is a specialist committee member on the oral health promotion in care homes and hospitals Quality Standards Advisory Committee at NICE. She is Trustee of the British Dental Health Foundation and Chair of the Shirley Glasstone Hughes Foundation Management Committee, which oversees the commissioning of funded research in dentistry. Professor Kay works for women as a member of the Equality Challenge Unit’s Athena Swan Medical Practice committee on its judging panels, and for students as Trustee and Vice Chair of the British Medical and Dental Students’ Trust.